Section 1. The name of this organization shall be the Kenneth Burke Society. Section 2. Official use of the Kenneth Burke Society's name shall be made only through the authority of the officers of the Kenneth Burke Society or by members of the Kenneth Burke Society at the triennial conference business meetings. Section 1. 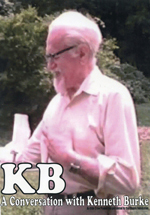 The purpose of the Kenneth Burke Society shall be to promote the study, understanding, dissemination of, research on, critical analysis of, and preservation of the works of and about Kenneth Burke. Section 2. The Kenneth Burke Society, a not-for-profit organization, exists for educational, scientific, and literary purposes only. No part of the organization's net earnings shall inure to the private benefit of any individual or group. No substantial part of the activities of the Kenneth Burke Society shall be the carrying on of propaganda, or otherwise attempting, to influence legislation. The Kenneth Burke Society shall not participate in, or intervene in (including the publishing or distributing of statements) any political campaign on behalf of any candidate for public office. Membership in the Kenneth Burke Society shall be open to any person or institution interested in promoting the Kenneth Burke Society's purpose. The officers or by members of the Kenneth Burke Society at triennial conference business meetings, may upon petition from an association whose objectives are consistent with those of the Kenneth Burke Society, grant to such an association the status of affiliate organization. Section 1. The officers shall be: President, Vice President, Secretary, Treasurer, and Editor of Publications. Section 2. The Vice President shall succeed to the office of President. Section 3. The officers shall be nominated and elected as specified in the Bylaws. Section 4. The duties of the officers shall be as specified in the Bylaws. Section 5. In the event of the incapacity of any officer, the remaining officers shall, at their discretion, elect a replacement or establish a nomination and election procedure for so doing. Members of the Executive Committee of the Kenneth Burke Society shall be the officers, the immediate past President, and the immediate past Conference Planner(s). All members are voting members. This committee shall have authority to act on behalf of the Kenneth Burke Society between the business meeting at one triennial conference and the business meeting at the next. Any action by this committee may be reconsidered at a triennial conference business meeting. The Kenneth Burke Society shall have such ad hoc committees (e.g., career award committees) as shall be created by the President or by members of the Kenneth Burke Society at the triennial conference business meetings and such ad hoc committees as shall be created by any other officers with advice and consent of the President or by members of the Kenneth Burke Society at the triennial conference business meetings. Section 1. Program sessions to promote the purposes of the Kenneth Burke Society shall be held as specified in the Bylaws. Section 2. Business meetings for all members of the Kenneth Burke Society shall be held as specified in the Bylaws. Section 3. A quorum for a business meeting shall be one percent of the members of the Kenneth Burke Society. Section 1. With the advice and consent of the officers of the Kenneth Burke Society or by members of the Kenneth Burke Society at the triennial conference business meetings, members of the Kenneth Burke Society may form Chapters within other professional organizations and associations whose principles are consistent with the purposes of the Kenneth Burke Society. Section 2. Each Chapter may elect the officers and adopt an organizational arrangement that is appropriate to the organization and association in which it functions. Section 3. Each Chapter may sponsor program sessions, hold business meetings, elect its own officers, distribute publications, and sponsor other activities consistent with the purposes of the Kenneth Burke Society. Section 4. Each Chapter shall delegate a representative of the Chapter to report on the activities of the Chapter at triennial business meetings of the Kenneth Burke Society. Section 1. The Kenneth Burke Society shall sponsor a conference for all members of the Kenneth Burke Society every three years referred to, in this document, as the triennial conference. Section 2. The Executive Committee or the triennial conference business meeting of the Kenneth Burke Society shall elect a Chief Conference Planner(s) whose primary responsibility shall be to plan the triennial conference in consultation with the Executive Committee and any additional committees deemed necessary. The Executive Committee shall announce the time and place of the triennial conference at least nine months in advance. Section 3. The Chief Conference Planner(s) shall submit a final conference report on costs, attendance, etc. to the Executive Committee no later than six months after the conference. Section 1. The officers, by majority vote, may initiate amendments to this Constitution. Section 2. Any member of the Kenneth Burke Society may petition the officers, which shall then mandate them to consider a proposed amendment. Section 3. Any 25 members of the Kenneth Burke Society may present a petition that will mandate the officers to submit a proposed amendment to the members. Section 4. Any amendment initiated as specified in the Sections above shall be voted on by the Kenneth Burke Society membership at the triennial conference business meetings. Such an amendment shall be approved by a simple majority of the members voting. The Kenneth Burke Society may be dissolved only at a special meeting called for such purposes, and in the manner prescribed by the relevant federal and state laws, by vote of the three-fourths of the members present. Upon any such dissolution of the Kenneth Burke Society, the Treasurer shall, after paying or making provision for the payment of all of the liabilities of the Kenneth Burke Society, dispose of all of the assets of the Kenneth Burke Society exclusively for the purposes of the Kenneth Burke Society in such manner, or to such organization or organizations organized and operated exclusively for charitable, educational, literary, or scientific purposes as shall at the time qualify as an exempt organization or organizations under Section 501 (c) (3) of the Internal Revenue Code of 1954 ( or corresponding provisions of any subsequent Federal tax laws), as the officers may determine. Section 1. Annual dues for members of the Kenneth Burke Society shall be determined by the members of the Kenneth Burke Society at the triennial conference business meetings. Section 2. Upon petition of 25 members of the Kenneth Burke Society, the officers must submit any decision to change dues to the members at the next triennial conference business meeting of the Kenneth Burke Society. A simple majority of those voting shall constitute approval. Section 1. Meetings of the Kenneth Burke Society and of its constituent bodies are normally open to all members. Each body shall establish its own rules. Section 2. The Kenneth Burke Society shall assume no responsibility for statements of opinion expressed by participants in program sessions sponsored by the Kenneth Burke Society or in such other conferences and meetings as it may sponsor or which may be sponsored by any Chapter of the Kenneth Burke Society. Section 3. The Kenneth Burke Society shall sponsor program sessions at its triennial conferences. Program sessions shall be under the direction of the Chief Conference Planner(s) (or whomever the Chief Conference Planner(s) may designate for this purpose). Policy implementation and financial obligations of such program sessions shall be subject to the approval of the Executive Committee and Chief Conference Planner(s), governed by the policies approved by members of the Kenneth Burke Society at triennial conference business meetings. Section 4. Program sessions shall be organized by the Chief Conference Planner(s) (or whomever the Chief Conference Planner(s) may designate for this purpose). Whenever possible, a call for papers shall be distributed to all members of the Kenneth Burke Society and papers shall be competitively selected if necessary, through a "blind review" process if appropriate, by a Selection Committee appointed by the Chief Conference Planner(s) (or whomever the Chief Conference Planner(s) may designate for this purpose). Section 5. The Kenneth Burke Society shall hold periodic business meetings for all members of the Kenneth Burke Society, at least at the triennial conference of the Kenneth Burke Society, and at other times and places to be determined by the officers of the Kenneth Burke Society. The officers shall notify all members of the Society of the date, time, location, and agenda of each business meeting at least two months prior to the meetings. Business meetings may be held in association with the scheduled activities of other professional associations and organizations. A person must be a member of the Kenneth Burke Society to be eligible for (1) nomination to candidacy for any elective office of the Kenneth Burke Society; (2) appointment to any appointive office or committee position in the Kenneth Burke Society; and (3) election to any elective office in the Kenneth Burke Society. Section 1. Any member of the Kenneth Burke Society may nominate any eligible person, provided this person is willing to serve, for any Kenneth Burke Society office during a scheduled election at a triennial conference business meeting of the Kenneth Burke Society. Section 2. The nominee for any office receiving a simple majority of the votes cast at a triennial conference business meeting of the Kenneth Burke Society shall be elected. Should no candidate receive a majority of votes cast, a runoff election shall be held between the two candidates receiving the largest number of votes. Section 3. Elected officers shall assume office at the conclusion of the triennial conference business meeting immediately following their election. Section 4. Elected officers shall serve three (3) year terms of office. The Secretary and Treasurer may each be re-elected, serving six (6) consecutive years altogether. Section 5. The business meeting at a triennial conference may authorize an email (or mail) ballot. Section 1. The President shall serve as presiding officer of the Kenneth Burke Society at its triennial conference business meetings and shall discharge the responsibilities normally adhering to the office. The President shall be responsible for the administration of the Kenneth Burke Society's business meetings. Section 2. The Vice President shall discharge the responsibilities normally adhering to the office and shall succeed to the office of the President in the event of the death, disability, or resignation of the President. The Vice President shall succeed automatically to the office of President at the conclusion of the President's term of office. Section 3. The Secretary shall perform the usual duties adhering to the office. If the secretary is unable to attend the triennial conference, the President will appoint another Executive Committee member to take minutes during the business meeting. The secretary (or appointed substitute) will submit these minutes to the Executive Committee for approval within 3 months of the conference. Section 4. The Treasurer shall perform the usual duties adhering to the office. The Treasurer shall present a report on Society finances at the triennial conference. If the Treasurer is unable to attend the conference, s/he will submit a report to the Executive Committee for presentation at the conference. Section 5. The Editor of Publications shall oversee any publications sponsored by the Society. Sometime during the year prior to a triennial conference, the Editor will solicit nominations for a new editor and make a recommendation to the Executive Committee. The Executive Committee's choice of a new editor will be announced to members. . The Editor will normally serve a term of three years, though this term limit may be waived by the Executive Committee and the business meeting of a triennial business meeting if exigent circumstances deem a waiver to be advisable. Section 1. The Kenneth Burke Society shall publish scholarly publications as shall be determined by the membership of the Kenneth Burke Society at its triennial conference business meetings. Section 2. The Kenneth Burke Society shall assume no responsibility for statements of opinion expressed by individuals in any publication sponsored by the Kenneth Burke Society or sponsored or published by any Chapter of the Kenneth Burke Society. In the absence of any provision to the contrary in the Constitution or Bylaws, all business meetings of the Kenneth Burke Society or the subsidiary bodies of the Kenneth Burke Society shall be governed by the parliamentary rules and usages contained in the current edition of Robert's Rules of Orders, Newly Revised. Section 1. Amendments to these Bylaws may be initiated by a majority of the officers or by a petition addressed to the officers and signed by 25 members of the Kenneth Burke Society. Section 2. Proposed amendments to these Bylaws shall be presented to the members present at the triennial conference business meeting of the Kenneth Burke Society for vote. Such an amendment shall be adopted if it is approved by a majority. A majority vote of the Executive Committee or the business meeting of a triennial business meeting may authorize the listing (see below) of significant actions under article IX for the purposes of institutional memory. Section 1. The Kenneth Burke Society shall present awards at the triennial conference for: (a) Emerging Scholar, recognizing promise of a Burke scholar who has established a record of publication (a book or journal articles/book chapters) as a graduate student or assistant professor (or, for independent scholars or non tenure-track faculty, within his/her first 6-9 years of work); (b) Lifetime Achievement, recognizing extraordinary achievement in Burke studies; and (c) Distinguished Service, recognizing extraordinary service to the Society. Section 2. The Executive Committee shall select three Awards judges from among past recipients no later than three months prior to the triennial conference. Judges should represent more than one discipline whenever possible. Section 3. The Executive Committee shall issue a call for nominations no later than three months prior to the triennial conference. The call should list past recipients and ask for nominations to be submitted to the Awards judges no later than one month prior to the conference. Nominees must be Society members. The Emerging Scholar nominee may be a new member; Lifetime Achievement and Distinguished Service nominees must have been members for at least fifteen years or, in cases where membership records are unclear, must have attended the triennial conference five times and/or served the Society as an officer, conference planner, etc. Awards judges should submit their decision to the Executive Committee and/or Conference Planner no later than two weeks prior to the conference so plaques may be prepared. Section 4. The Kenneth Burke Society shall present an annual award for best article in the KB Journal. Every January, the Executive Committee shall select three judges to evaluate the articles published in the course of the year and to select a best article for the year the following January. Judges should be people who don't expect to appear in the journal during the year and should represent more than one discipline whenever possible. Judges may be members of the editorial board or past recipients but need not be. Recipients will be announced in KB Journal; at each triennial conference, the previous three annual recipients will be honored. Section 5. A list of past recipients of the Society and journal awards will be maintained by the Executive Committee and posted on KB Journal.